Our situation officially remains “abnormally dry” according the the US Drought Monitor (http://www.drought.unl.edu/dm/monitor.html) but we’ve only had a little more than a half inch of rain in the last 3 1/2 weeks so I say enough is enough. The big pattern should shift to the east enough to allow for a front to get into the area and bring our best chance for rain in about 4 weeks. There are water restrictions in part of the area….parts of Shelby County. It seems to me they either need to increase the water supply or build a big pipe to the Ohio River if they are going to keep growing. The blame was put on increased water usage but I say its more likely an increase in people. Hurricane season starts tomorrow. The first storm will be Barry because the National Hurricane Center already used up Andrea on what they called a “subtropical storm” a few weeks ago. The hurricane center is in a battle with Dr. William Gray, who started making predictions several years ago. While he’s still in business, the gov’t cut his funding and started putting out their own forecasts. He says its in retaliation for his pooh-poohing the man made Global Warming argument. There may or may not be validity but I suspect the big wigs at NOAA didn’t want him getting credit. After all, these are the same people who are going to change the National Hurricane Center to the NOAA Hurricane Center…or something like that. I’ve already noticed that NOAA is making its name more prominent in all press releases. Such narcissism. Funny thing is…Gray is pretty specific…he says 17 named storms and 9 hurricanes. NOAA’s NHC says 13-17 named storms and 7-10 hurricanes. The government has a better chance of not being wrong. But if you think about it…17 represents a 30% increase over 13 and 10 is a 42% increase over 7. When I was in school, a margin of error that large left me with a big fat “F”. Here we are at the end of May. Typically we are still talking about severe weather threats and such. This year we have hardly done so at all. The long wave pattern (i.e. the big picture) set up several weeks ago such that the storm track stayed to our west and we are almost in a summer pattern. A big fat ridge has been over our heads more or less for a month now, limiting rain and elevating temperatures and making things quite mundane in the weather department. Now we are talking about rainfall deficits. Its way too soon to be speaking of such things but it appears that is in the cards. Also, we’ve been looking at the potential for air stagnation. Now, last week, I made sport of the folks who make such declarations as we were going to be stirred up enough to keep things reasonable. This weekend it became apparent that this week would be more soupy and so yesterday the APCD decided at midday it was a good idea to put out an Air Quality Alert since it was already in the unhealthy for sensitive groups range. Today is the same thing and this time its legit so try and do your part and don’t call me to complain. It is what it is. I wonder if the state lawn mowers will pay heed this time. I will talk more about the upcoming hurricane season when it starts but if this pattern is the shape of things to come, it may very well be active for the US. Some time in 1806, Andrew Jackson felt his wife had been slandered by a Kentucky lawyer. Seems there was some paperwork foul up on her first divorce in 1791 so this chap called her a bigamist! Andy would have none of it and demanded satisfaction. Charles Dickinson, who was considered an excellent shot, and Jackson stood apart 24 paces in Logan County Kentucky in a traditional duel on this date in 1806. Dickinson did not live up to his reputation as he fired first and just grazed Old Hickory, who took careful aim and killed Dickinson with a return volley. Though not recorded in history, rumors suggest that Jackson participated in numerous duels which derived from questions regarding his wife’s honor. Its not clear if Jackson began to wonder the veracity of his wife’s honor after the allegations piled up. I mean….where there’s smoke there’s fire, right? No matter, Jackson was elected President in 1828 and as he took the oath of office in 1829, his wife promptly died, perhaps relieving the nation of the prospect of having a dueling President. If you recall America’s first duelist in the Executive branch had been Aaron Burr who as Vice-President killed Alexander Hamilton who also missed on the first shot. Burr subsequently suffered the death of his political career while Hamilton became the face of the 10 dollar bill and Jackson’s mug found its way on the twenty. Which raises the question: If Millard Fillmore had participated in a duel, would he have been placed on the fifty? Many of us know someone who made the ultimate sacrifice on behalf of our country. Most who have died though remain unknown to but a few. And those who gave their lives did so for people they did not know and for those who weren’t even born yet. But, they did know the beneficiaries would be Americans and the ideals of freedom that have influenced millions world-wide. While we may not know them, we know what they did and we know what we should do. Take time today to reflect on the gifts of others that make days like this, to spend with friends and family, possible. 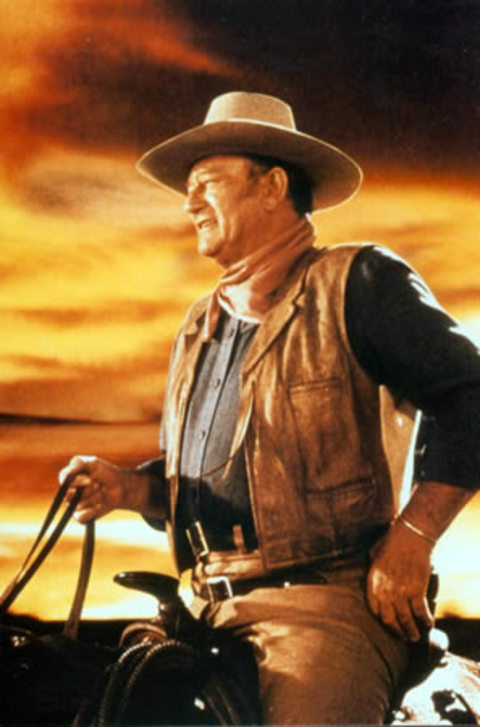 John Wayne turned 100 today. I would say that “if he were still alive” but through his films, he is still alive and always will be. He’s been dead since 1979 but his name still shows up on the top ten of movie goers favorite movie stars. I believe he is the only deceased star to still be a top-ten star. I have been watching lots of John Wayne movies this weekend. I’ve seen Chisum three times in 24 hours…like I already don’t know all of the lines. Alot of the same guys in that movie were also in Big Jake, including Robert Mitchum’s son. Anyway, if you don’t want to spend the holiday weekend watching old John Wayne movies, I think he would like it if you just took some time to remember what Memorial Day is all about. Alot of people gave their lives so that we can have barbecues or watch John Wayne go to the church of our choice or do nothing at all. Sometimes we forget what the holiday is about and its not just the unofficial start of summer and its not just a time to go to the ballgame or concerts. Weather still looks to be more of the same…if you liked Saturday you will love Sunday and Monday. A frontal boundary may be close enough to conspire with afternoon heating to trigger off an isolated t’storm but that type of thing should be confined to the extreme north and northwestern quarter of the viewing area. At this point, it appears the ridge may break down enough to allow a front late in the week to trigger some much needed general rain fall. Have no fear…the Memorial Day Weekend is here and there really isn’t too much to fear. A big fat area of high pressure will continue to generally dominate. A couple of frontal systems will try to penetrate but will come up empty. A front late Sunday may sneak far enough south to get into the middle part of Indiana and may be sufficiently close to conspire with afternoon heating to create a couple of renegade afternoon t’storms. However, most people should remain dry and if I were you, I would not curtail any activities. I certainly won’t….I’ll be working! This Date In History On May 25 in 1965, Muhammad Ali defeated Sonny Liston a second time to retain the heavyweight championship he had won from Liston on February 25, 1964. I’ll spare you most of the details as they are well documented. But, did you know that the fight was supposed to come in November 1964, but Ali had a strangulated hernia. Not sure what that is but it sounds like it hurts. Then they rescheduled it for Boston. But, the promoters didn’t have a license to promote fights in Massachusetts. For some reason, instead of getting licensed, they moved the fight to Lewiston, Maine. Why they would be licensed in Maine and not Massachusetts is beyond me. If you find out what the story is, you can share it with us. Anyway, because it was in Maine’s second largest city, only 2434 people saw the fight live. The bats draw more than twice as much as that on a daily basis. It was the lowest attended championship fight of all time. Sonny Liston was feared. Many boxers wouldn’t fight him. Top contender Henry Cooper said if Ali won he would seek a shot at the title but not if Liston re-claimed the crown. Later, another boxer, George Foreman was feared. Ali overcame any fear he may have had, accepted the challenge and secured his lore as one of the greatest of all time. While the first fight against Liston was amazing and along with Ali’s 1960 Olympic gold medal put him on the boxing map, the second fight started the legend of Muhammad Ali…and it also stands as testament of what can happen when one’s faith is great enough to overcome one’s fears. BTW….my email is rsymon@wlky.com. Some places on the web page are not correct. I apologize on behalf of Brian the Webhog for misleading some of you. He assures me it will be corrected….please don’t think I’ve been trying to avoid your comments. Gas Masks For Man and Beast? Do Not Call Me To Complain! May 22 and May 23 were Air Quality Alert Days. People called to complain. What they were complaining about is not entirely clear but they wanted to know why there was an air quality alert. I responded it was because the Louisville Air Pollution Control District made the forecast. Today, one caller wanted to know why the meteorologists were lying about the air pollution. I asked him if he wanted the phone number to the Air Pollution Control District(APCD) as I explained we do not issue such declarations so cannot possibly be lying. Please do not call us. A tip from the APCD is to refrain from using small engine gasoline devices, like lawn mowers, particularly in the afternoon. A co-worker reported to me that he saw a number of men on lawn mowers along I-71 Wednesday afternoon. I guess state lawn mowers are exempt from Air Quality Alert tips, though thats not reflected in publications of the APCD. Weather conditions for Tuesday and Wednesday were for highs in the upper 80’s and afternoon winds increasing to 7-15 mph. Dewpoints fell to the mid 40’s on Tuesday and near 50 on Wednesday. This is due to dry winds from aloft in the atmosphere mixing down and turning over the atmosphere at the surface resulting in drier air. I am not aware of any academic meteorological work that suggests evidence of an atmosphere mixing out along with surface winds of 7-15 mph is considered to be stagnant. However, I have not read every meteorological textbook. Conditions were hazy, especially on Wednesday, from smoke originating from the fires in the Southeast. But today’s guilty party was supposed to be low-level ozone. Those are the facts. You make the call regarding what to make of it. But dont call me. I’m not really sure what anyone has to complain about. If we all were a little more careful about our actions all the time, it would not be an issue. I don’t know how the forecasts for pollution are determined or who makes the determination. We just report what the government entity responsible has presented…even if the guys cutting the grass along public highways don’t pay attention. Here is the AIRNow site, which is supported by government agencies but apparently is not a government site so you can monitor air quality forecasts all across the country! We are in a rather boring weather pattern which is good if you want good weather. A big ridge of high pressure is over the Ohio and Tennessee valleys. That means that it will be tough for any fronts to come down here. While we will be warming and humidity increasing, afternoon temperatures probably won’t be sufficient to overcome the suppression of the high. Rain chances, even for isolated or scattered activity has been taken off the table for the rest of the week and my guess is that it won’t be a problem for the Memorial Day weekend. So..what’s up with Charles Lindberg? On This Date In History: Charles Lindberg flew solo from New York to Paris and landed on May 21, 1927. He got the name “Lucky Lindy” because many people had perished attempting to make the crossing of the Atlantic and several of them were not flying solo. Lindberg landed at Le Bourget Field in Paris late on Saturday night as tens of thousands of revelers came and turned lights of their automobiles on so Lindberg could find the field. Remember, aviation was in its infancy and night flying was not a routine happenstance. While Lindberg was getting mobbed in the early morning hours of May 22 as he wobbled in exhaustive exuberance, back in St. Louis, Missouri….the city whose name was the moniker for Lindberg’s plane The Spirit of St. Louis…a young woman smiled with joy from her own laborious exhaustion after bringing a new life into the world. Her name was Elizabeth and until her marriage a few years earlier, she was known as Elizabeth Carter. On this day 80 years ago her husband, Benjamin Goodall Symon, stood close at hand. He was the first of the Symon family to be born in the United States after the family immigrated from Scotland. And their new son became known as Robert Bruce Symon. The name Robert Bruce derived from the direct lineage of the family of Scottish King Robert the Bruce. Robert Bruce Symon went on to marry Anna Sutter of New Orleans where they eventually had three children, including their only son, Robert B. Symon, Jr. It has been said that the reign of royalty ended with Robert the younger, yet he is eternally grateful for his father’s efforts which continue to this day. While I have time to correct the fact that I have failed to live up to my father’s legacy, there is never enough time to tell him the degree to which I love him and am honored to be his son. There’s a new sheriff in town and he’s making all sorts of noise. The Director of the National Hurricane Center(NHC) just took over for the retiring Max Mayfield in January and he has been making noise and this time someone should listen. It seems that Bill Proenza is upset that his budget has been cut but $700,000. Now that doesn’t seem like much but with inflation that’s a real cut. Toss in the fact that inflation makes that hurt a little more and the public attention is on hurricanes and the hurricane center, you would think the US Government would want to really keep that department running well with happy people and a fully funded effort. Let’s go beyond that…Proenza says that while his department suffers cuts, the National Oceanic and Atmospheric Administration(NOAA) that is the overall umbrella agency in which the NHC falls will be spending some $4 million to publicize NOAA’s 200th birthday! And they are considering spending money to change the name from the National Hurricane Center to the NOAA Hurricane Center! Of course NOAA denies it…in this story linked first below, it says its only $1.5 million on the birthday. That reminds me of the time that Burgin did a story that involved a police officer we said ran a stop sign while looking at Halloween decorations. The officer denied it…he insisted he was not looking at Halloween decorations..he was talking on the cell phone. Never mind he ran the stop sign and broke the law and never mind we are spending tax dollars on telling us about NOAA’s history and silly narcissism of having their name on the NHC moniker. Everyone talks about the deficit. Congress just came up with a $2.9 trillion budget. If we could live on say $2.6 trillion there would be no deficit and we could start with NOAA and their birthday party. I suspect there are all sorts of budget items like this that could go and you wouldn’t have to cut education, or the military, or the war on terror, or school lunches or any social programs. What we need is Charles Grodin who played Murray the accountant in the movie Dave and let him spend an afternoon with the budget. I’d encourage you to contact our new congressman and tell him you want to stop the party and leave the name plate alone. Let the folks at the NHC do their job and keep NOAA out of the public relations business. The NHC’s job and record speaks for itself. Another of his lines regards statistics. He said “there are three kinds of lies: lies, damned lies and statistics.” People toss about statistics all the time as proof for one argument or another. When, in fact, statistics can be manipulated to tell the story we want. For instance, when I was a young stock broker, I once made up an entire sheet to show the performance of a mutual fund. My result was a higher rate of return than the company said. I studied and studied and all of my math was correct. The numbers were all correct except that I had based my entire calculation on the net asset value and did not include initial sales charges that the customer paid. Inadvertantly, I was about to use proper and accurate statistics in a misleading manner. Fortunately, I found the error and did not make the presentation but learned a valuable lesson and that is the thorough review and analysis must be taken in any subject even with a plethora of seeming accurate statistical data. The other day, I said that tornado deaths had gone up in the recent years. That is true. According to the SPC, US tornado deaths have gone from 36 in 2004 to 39 to 66 to 73 so far this year. So, one might write a headline : “alarming statistic shows tornado deaths increasing!” And, without the hyperbole, it would largely be accurate, though it would be misleading and incomplete and some might say untruthful. Thats because from 1997 to 2006 the average death toll was 62.3 and that was with a very high year in 1998 of 130. If you were to take the four year total from 1998 to 2001, then you could say that tornado deaths had decreased each year and had dropped some 75%! The point is..be careful of statistics. Look farther than what the author might imply and see for yourself if the data indeed tells the truth. Here is a recent story with a headline that is accurate but a bit misleading, but its accurate. This date in History : In 1770, Marie Antoinette married King Louis. She lost her head over it 23 years later. I think everyone ate cake afterward. Been A Pretty Quiet Severe Season…What About Tonight? Well, if you note above, the folks at the Storm Prediction Center (SPC) have us barely in a “slight risk” for severe weather. Tornado Alley had a persistent strong jet stream coming up from the southwest. Below that, there was also a warm, moist southerly flow from the Gulf of Mexico destabalizing the atmosphere. We will not have those same conditions. For much of the day, we will have a fair amount of energy available but nothing to really kick it into gear. There is a “cap” on the atmosphere that will be generally sufficient enough to overcome any afternoon heating. Think of it as a pile of wood. That is potential energy, but you still need a match to ignite it…otherwise, its just a pile of wood. The only ignition source we will really have is a cold front coming down. By the time it does come down, much of the energy will be gone as we head into the cool of evening. Nighttime does not always reduce the amount of energy available but in this case it will. So, its like when someone does bring a match, much of the wood has been taken away. So, here’s the bottom line: the best chance for severe weather will be well to our northwest late this afternoon. Ahead of the front this evening, our rain chances will increase. Strong storms will be possible but not necessarily probable. The biggest threat would be for high winds or hail associated with embedded small bow echoes. My suspicion is that any bow echoes would be those that had already formed and moved into our region, plausibly on the down cycle of its life. But, as they say in sports, a team may be one way on paper, but you don’t know until they play the game. While we aren’t talking about twisters too much, yesterday in the plains, there were 10 tornado warnings…and there were 9 tornado reports. NWS did pretty good. On This Date In History In 1896, a tornado, similar to the recent one in Kansas, wiped out the town of Sherman, Texas. The lid of a trunk in Sherman was found 35 miles away. Like the Kansas storm, it was considered to be an F-5 (now EF-5) tornado based on the total destruction. Unlike the Kansas tornado, 73 people died. The folks in Greensburg, KS had about 20 minutes warning; the people in Sherman probably had none. While tornado deaths are up this year and have been rising for the past 10 years or so, overall they have decreased since the advent of radar systems. In 1756, the French and Indian War began. That’s what we call it. In Europe its called the Seven Year War. The English declared war on the French on this date but there had been skirmishes between the two sides in North America for years. Remember, the colonists were on the side of the crown at this point. It wasnt until after the French and Indian War that we started getting independent fever, in part because the crown had to find ways to pay for the war and for future colonial protection. So, George Washington at this time was an officer in the British army and an aid to a General Braddock. On July 9, 1755….a year before the declaration of war…an army of 1459 British were ambushed. Washington had been very sick in June but insisted on joining the battle. The English got their clocks cleaned at the battle of the Monongahela with 1000 of their ranks killed, including General Braddock. That left Washington as a target of the enemy. Washington’s account in letters of the time was that he had two horses shot from under him and found four bullet holes through his coat. I had read of another account from the enemy sharpshooter that said he had George in his sights and his gun misfired. This is one of many instances in the public life of George Washington which many people use as evidence of Divine Intervention of Divine Providence in the life of the father of our country. Regardless of what you may think, you do have to consider if we all may be British Subjects if the French and Indians were better shots or had guns that worked.